Modular stackable roll storage up to 36" in length. The ideal solution for easy stackable access to rolled drawings. 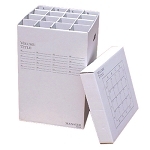 Perfect for economical and durable permanent storage of documents, prints, graphics, art, maps, film, etc. Trussed interior for exceptional stacking strength. Modular design for easy relocation in office or permanent storage. End access for easy retrieval when stacked. Labeled integral end flap for easy identification and organization. Attractive corrugated cardboard with deep gray lettering on white background. Single unit can be used vertically. Large compartment stores up to a 4" roll or a multiple of smaller rolls. Small compartment stores up to a 2½" roll or a multiple of smaller rolls. Shipped flat - 2 unites per package. 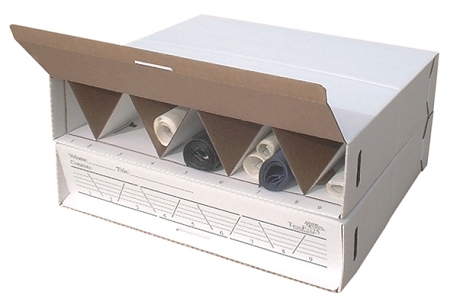 Ideal to store documents from 11"x17" to 24"x36"
Stores misc. items up to 24" in length. Shipped flat - 2 units per package. Ideal to store documents from 22"x34" to 36"x48"
Stores misc. items up to 36" in length.